The Linksys wireless USB adapter adds wireless capability to your computer to connect to a wireless network. This adapter also lets you connect to any public wireless hotspots eliminating the need to physically connect an Ethernet cable to a network device. Even peripherals like printers already have wireless connection capability which allows for flexibility and mobility. The Setup CD that came with your Linksys adapter. If it is lost, you can download the updated driver of the adapter first by visiting the product page at the Linksys Support Site. Click here for the step-by-step instructions on how to download the driver. Plug in your wireless USB adapter to an available USB port on your computer. If your wireless adapter comes with a USB cable, you may plug one end of the cable to your computer and connect the other end on your wireless USB adapter. QUICK TIP: The LED light on your wireless adapter should light up after plugging it to your computer. Make sure also that the computer you are using is located in an area where it can receive the optimum signal from your wireless router. You can install the drivers by running the Setup CD or by manually installing the driver you downloaded from the Linksys Support Site. 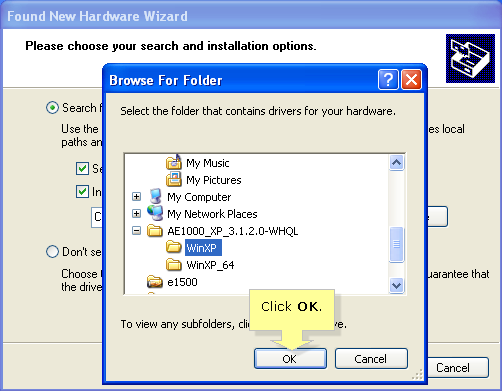 Once the adapter is plugged in to the computer, Windows® XP will automatically detect your wireless adapter. 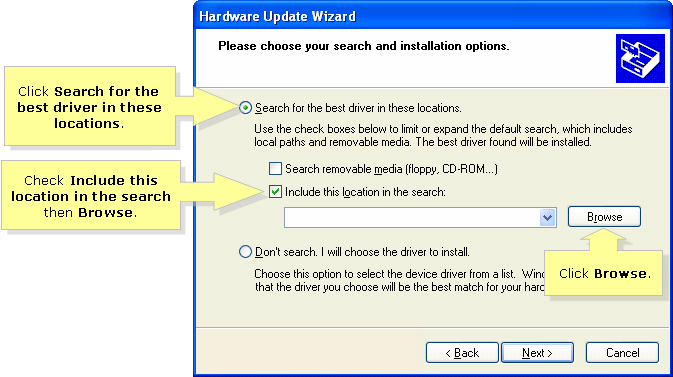 On the Found New Hardware Wizard window, select Yes, this time only. 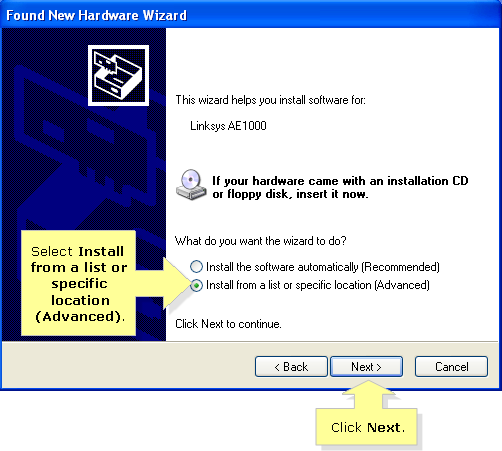 Insert the Setup CD into the CD/DVD drive of your computer then click Next. Once the Setup Wizard has finished with installing the driver, click Finish. You may now connect your computer to your wireless network. 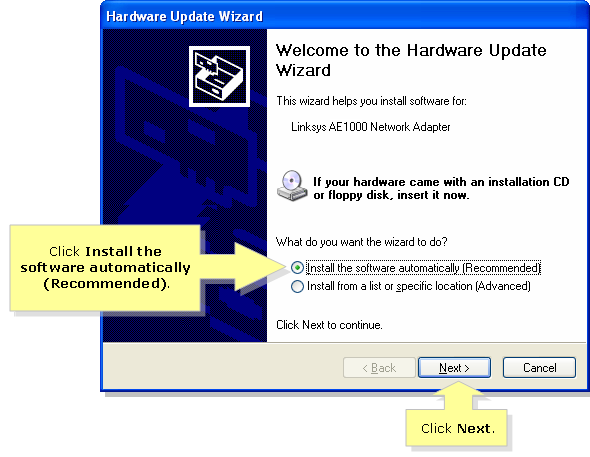 Once the wireless adapter is detected, the Found New Hardware Wizard window will pop up. Select No, not this time then click Next. Select Install from a list or specific location (Advanced) then click Next. Click Search for the best driver in these locations. Check Include this location in the search then click Browse. Select the driver for your device and click OK. Then, click Next. Windows will locate and install the driver of the wireless adapter. Once done, click Finish. You can now connect you computer to your wireless network. If you want to improve the range of your wireless network, first you need to ensure that you place your wireless router on a spot where obstructions (such as furniture, fixtures and tall appliances) are least. These will block the signal which will shorten the range of your wireless network.